Producing power used to be so simple when it seemed like fossil fuel would last forever. But since we’ve wised up and realized that finding and developing viable alternatives is a rather urgent priority, amazing concepts have abounded. 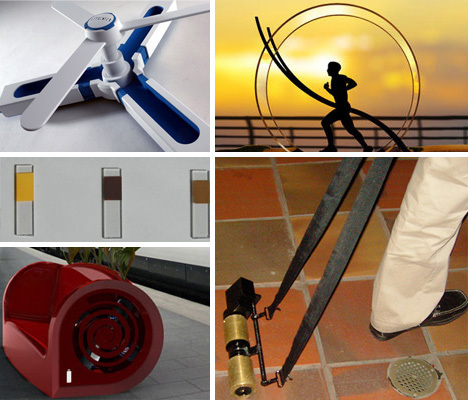 From wind power to foot power and from the predictable to the slightly insane, these 10 concepts could one day power our world. If you’ve seen the wind farms that are popping up all over the world, you’re probably already aware that wind power is one of the cleanest, greenest alternative energy sources out there. Aside from purchasing special “wind credits” from your energy company or installing a tall turbine in your backyard, there aren’t currently many ways to take advantage of the wind for powering your home. The Wind Cube concept would change all of that. It’s designed to work in an array, bolted onto the side of a house with a handful of other identical turbines. Just 15 of these small home turbines on a house could provide enough power for a family of four. Few things in life are more frustrating than being stuck waiting for a train with absolutely nothing to do. 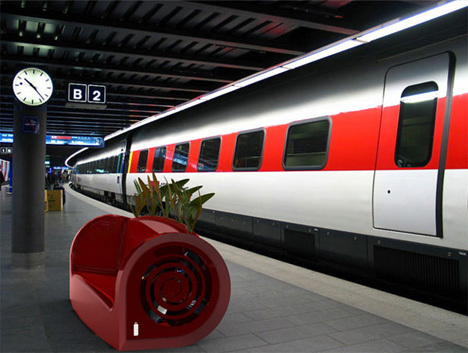 The Charger Sofa would keep all mobile gadget-lovers supplied with plenty of power for their dying gadgets – and it would generate that power from the wind coming off of the passing trains themselves. 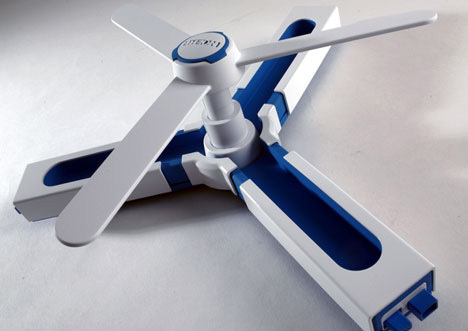 The subway platform seat would feature fans in both ends that would spin with the wind, generating energy that could then be used by passengers through the outlets located on the sofa. Just a few minutes could give mobile gadgets a needed boost and keep them going until you get home or to the office. 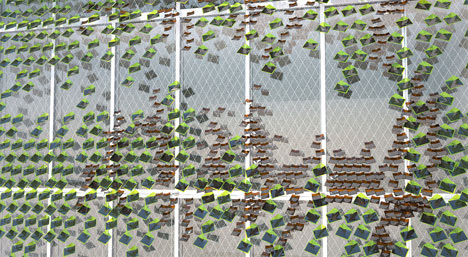 Solar Ivy is a clever system that mimics nature to provide buildings with a boost of natural energy. Hundreds of tiny solar “leaves” soak up the sun on the exterior of buildings and send that captured energy inside. Thanks to software developed by the company behind Solar Ivy, the leaves can be placed in the perfect positions to catch the most rays without being obscured by shadows from surrounding leaves. One of the big barriers to getting solar panels onto more buildings has always been the prohibitive cost. 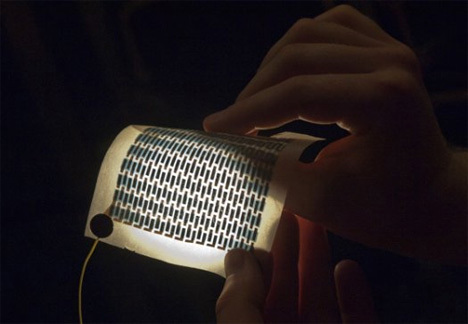 A team of engineers at MIT might have that problem licked with their invention: solar cells that can be printed right onto a piece of paper or thin plastic. Even when folded hundreds of times the printed cells are just as efficient in gathering the sun’s rays as they were when brand new. There is a lot more work to be done on improving this new technology, but it’s a promising glimpse into the future of solar power. Typical chemical batteries – the ones we use in our flashlights and kids’ toys – are rough on the planet. 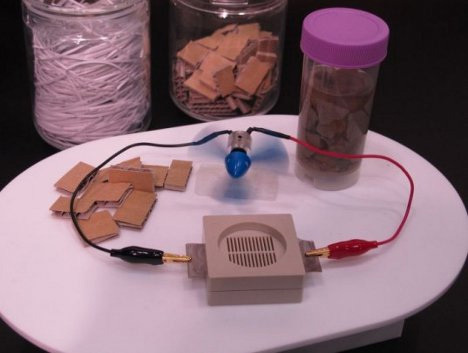 Batteries that run on natural materials are much more eco-friendly but not usually as efficient. Such is the case with this cellulose battery. It uses special enzymes to break down and extract energy from cellulose, which is the same way termites digest wood. Although the system is woefully inefficient at this point, it is still early in the development phase. Hopefully someday natural batteries will be powerful enough to make harmful chemical batteries obsolete. When you see people running in the park, you probably don’t think of them as the perfect electricity generators – but they could be. The Green Wheel concept would put huge human-size hamster wheels in scenic locations and invite the public to climb in and take a jog for the good of their community. The wheel generates energy as it turns, which is then passed on to streetlights, stoplights and other public electricity-grubbers. Everyone would benefit from a setup like this: runners would still get their exercise, the city could rely less on fossil fuels and everyone could pay less to keep the city lit at night. In the case of a long-lasting power outage, how would you keep your essential electronics going? The Yill could be the solution. After being plugged into a power source for four hours, the portable device can power an entire computer workstation for three days. It can be used in conjunction with solar panels or wind turbines to store clean energy so that not one kilowatt goes to waste. As long as most of us are still using fossil fuels to fuel our vehicles, we might as well get some secondary energy from every gallon of gasoline. The Voltair Vertical Turbine concept involves setting up tons of turbines along busy roadways so that they are turned around and around by the wind from passing cars. As the turbines turn, they generate energy which can be used to power public utilities, toll booths, service areas and so forth. A concept that makes double use of polluting fossil fuels without creating any new waste sounds pretty brilliant. Solar panels are great, but they seem a bit old-fashioned. And given their relatively low efficiency rating, our solar energy collection methods are long overdue for a tune-up. 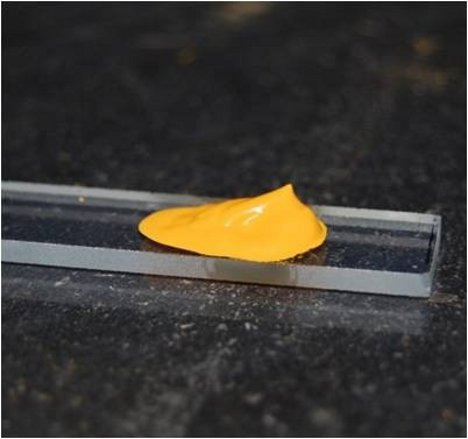 A research team at the University of Notre Dame has developed a solar “paint” that is cheap to mass-produce and would look just like regular house paint when applied to the exterior of a home. While the team is still working on making the paint significantly more efficient, the idea is an exciting leap forward for everyone who want to use solar power but doesn’t want to bolt those unsightly panels to the top of their home. 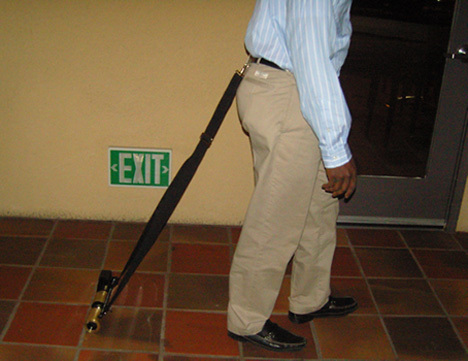 The device above may look a little odd, but as its wearer walks around he’s generating valuable energy. 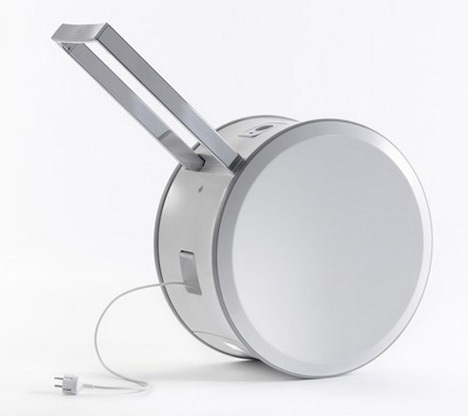 Specifically designed for rural areas in Africa, the Green Erg is a clever dynamo generator that attaches to one’s waist and provides enough energy to charge a cell phone. It works by simply walking, and it will generate power on any type of terrain. Will it save the world? Probably not. But it’s a great example of adaptive design and can help to keep separated families in contact.